President Rivlin and his wife hold dinner in honor of Czech president and his wife. 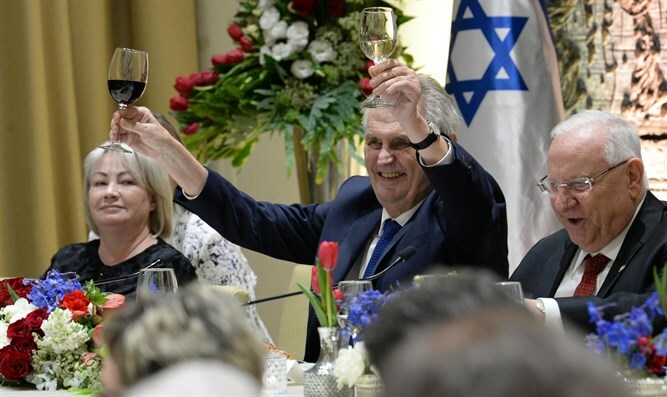 President Reuven Rivlin and his wife Nechama hosted a state dinner on Monday evening in honor of Czech Republic President Milos Zeman and his wife Ivana Zamanova. At the opening of the meal, the two presidents delivered greetings. President Rivlin received his guests and said: "Dear friends of Israel, dear friends of the Czech Republic, it is a great honor to have you here tonight, formally, this is an official meal, but in many ways we have dinner with old and close friends." The president noted Arik Einstein's song "Prague" written by Shalom Hanoch and sang together with the audience a few words of the song. He told Zeman that five years since the death of Einstein, one of the greatest singers in Israel, he had already quoted the song. "We are friends from the past, Mr. President, but our friendship does not belong only to the past. Today, the relationship between Israel and the Czech Republic is a strategic relationship, with direct flights between Prague and Tel Aviv, and with the Skoda Innovation Center established here in Israel. But we can do a lot more together, in business, in culture, in science, in security, in energy and in tourism, if I mention only a few areas," said the president. The president of the Czech Republic said in a speech of his own and surprised a moment before all the participants took a toast. "On my table there are two glasses, one of red wine and one of white wine, as you sometimes know, these colors are a symbol of politics, but today I wanted to say that there are some common issues between the two countries. So for the first time in my life, I'll take both glasses and toast to life."